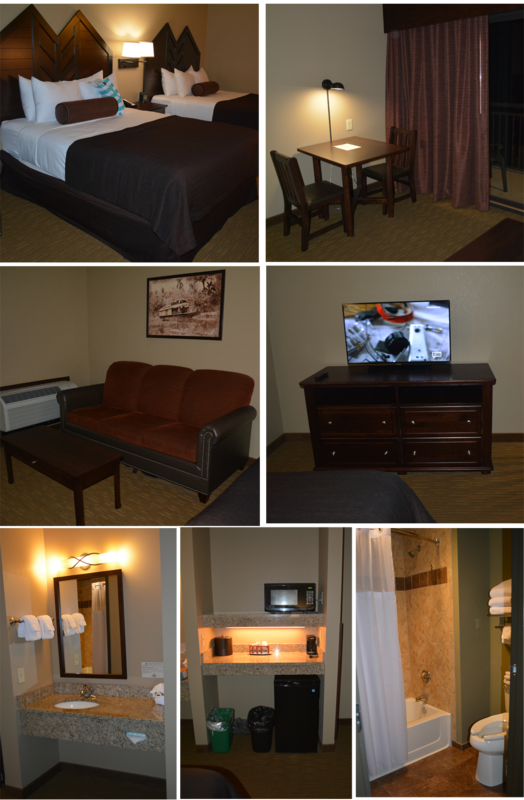 Book your stay at the Camelback Resort, your family friendly destination all year long. From winter skiing on Camelback Mountain to the indoor water park, ropes course, arcades and mini golf – your adventure awaits in PA! Every summer we travel from the east coast to Michigan, and every time the kids and I do not look forward to the 15 hour drive. But this year was different, we decided to stop half way and start our vacation off at the Camelback Mountain Resort, located in the heart of the Pocono Mountains. While the kids knew that we would be staying at the Camelback Resort, they thought it just an ordinary hotel. Seeing their eyes light up when they spotted indoor waterpark, the video games, and indoor ropes course was priceless. My husband is often left out when it comes to visiting attractions due to his work schedule, so it was great to experience this year-round destination as a family. 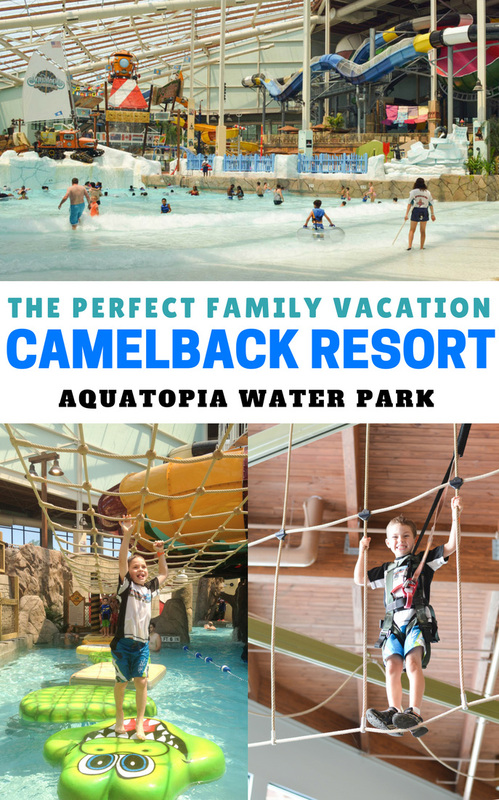 The eight-story Camelback Lodge is located at the base of Camelback Mountain and transforms the Camelback Resort, which is widely known for skiing in the winter, into a year-round family friendly destination with the addition of Aquatopia. 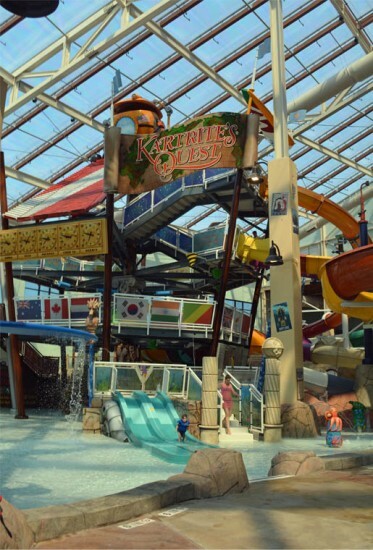 Aquatopia is one of the best indoor water parks in PA. The Camelback indoor water park is the largest indoor water park in the Northeast with seven pools and 13 waterslides. 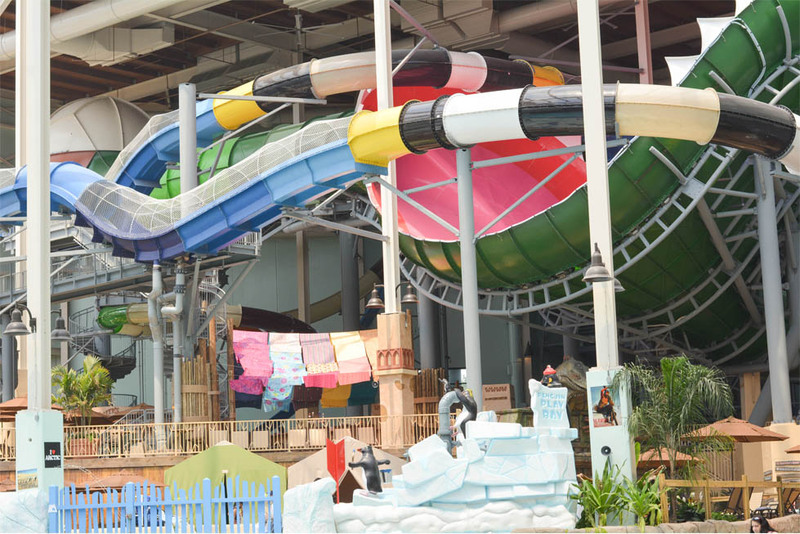 Families will enjoy soaking up the sun indoors at a comfortable 84-degrees with plenty of water fun for adults, teenagers, as well as toddlers. 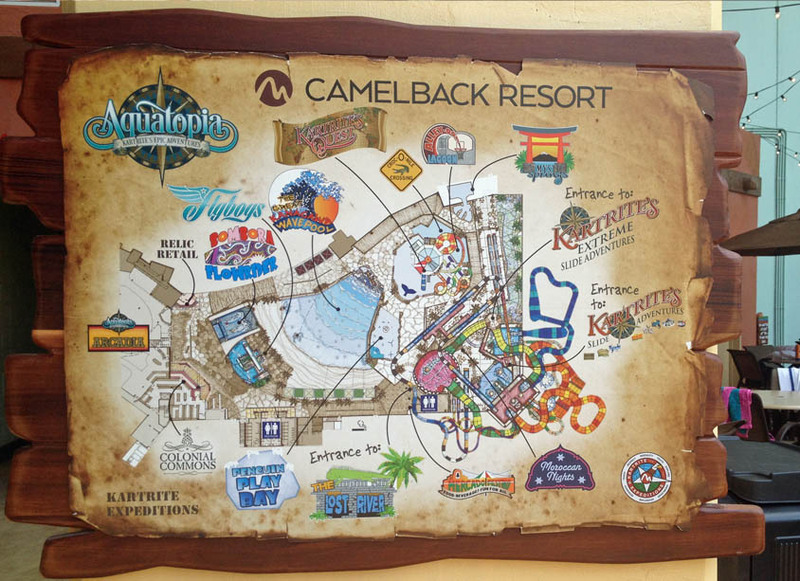 The theme ofCamelback Resort is based off of the adventures of Kartrite Van Der Berris. Kartrite Van Der Berris, the legendary explorer, having traveled the world over, came upon Camelback Mountain on one of his frequent expeditions to the Pocono Mountains and envisioned a grand lodge at the base of its peak, filled with wonders from the corners of the Earth. Here visitors would stay and experience the splendor of the mountain year-round in a lodge with a blend of rustic craftsman style and contemporary finishes, and at its core, an awe-inspiring indoor water park named Aquatopia, filled with the relics and treasures from his worldly travels. 7 pools and 13 waterslides. 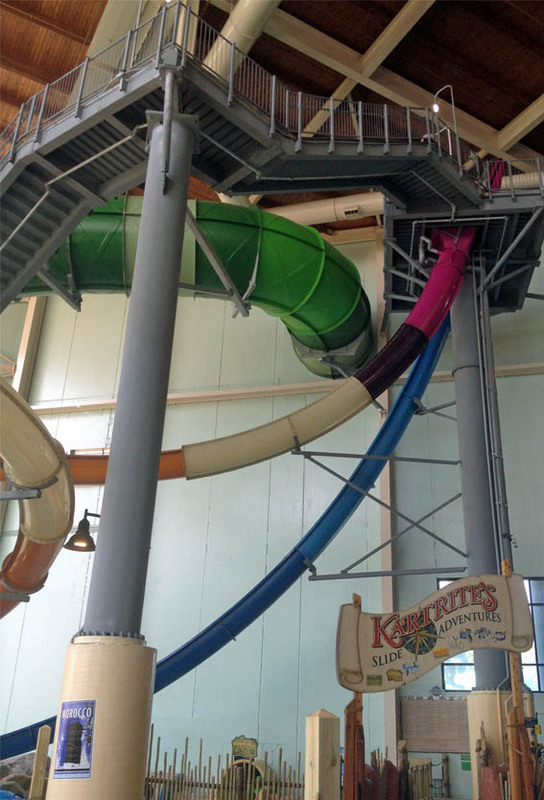 Storm Chaser- the longest gravity-defying uphill water coaster to exist in any indoor waterpark in the U.S.
Venus SlydeTrap- a world-premiere attraction that combines three exhilarating waterslide experiences in one. The Lost River- the lazy river is a dark, adventure river experience with LED underwater and theatrical lighting. The Great Ka-Na-Gawa Wavepool – the wave pool has zero-depth entry to six feet deep. Bombora FlowRider surfing simulator – For beginners or more advanced riders. 42ʺ″ height requirement for Boogie Board; 52ʺ″ for stand up FlowBoarding. Swim up bar – 21 and older only area. Colonial Commons- quick service restaurant located inside the water park area. Americana-themed eatery offering burgers, hot dogs, fries, pizza and cold beverages. *Towels are provided, life jackets are available for use and lockers are also available for rental inside the Camelback water park. 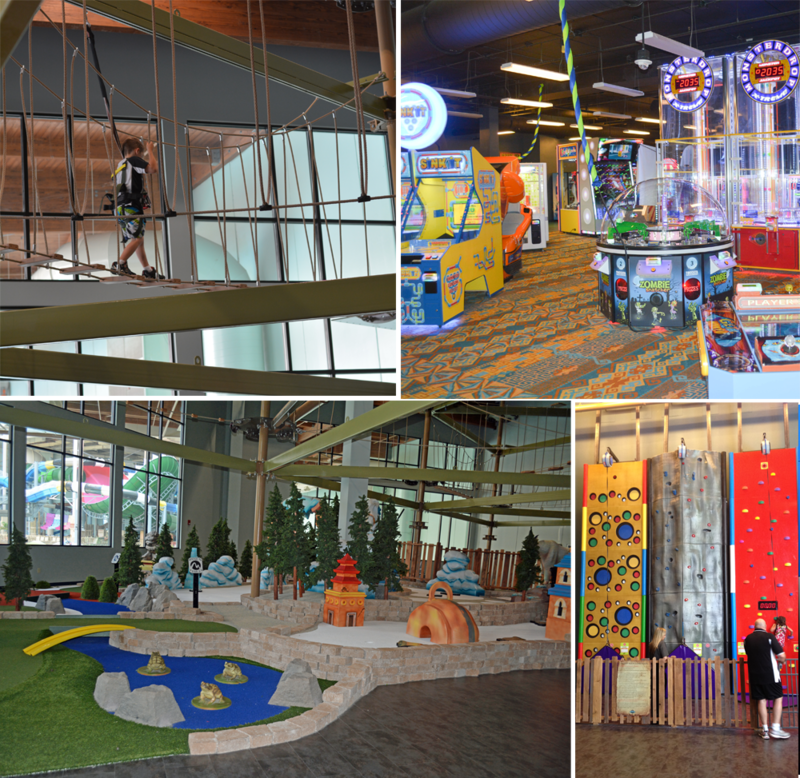 In addition to the 125,000 sq foot indoor waterpark, there is plenty to do including the Camelback ropes course, mini golf, laser tag, and over 100 arcade games. Two mountain adventures have been added to Camelback Resort since our visit, the mountain coaster and snow tubing. Arcadia Family Adventure Center – two levels of themed activities including over 100 video, interactive and ticket redemption games. Kartrite’s Kids Quest – a themed soft play area for the littlest of adventurers. Hemispheres- offering family meals and ambiance. Neptunes – a maritime-themed lobby pub serving soup, salad, sushi and more. Trails End Pub & Grille. While there are restaurants and snack bars available on site for meals and beverages, all guest rooms include a snack-size refrigerator as well as a microwave that allows families to bring their own meals, as well as reheat previous meals. We used our Camelback Resort Amenity Credit to purchase a pizza, and combined with the coupon for buy 1 pizza, get 1 free, we had leftovers pizza to reheat. We also brought along drinks, as well yogurt and milk for cereal for breakfast and had plenty of room in the fridge to keep them all cold. While most of our stay out spent in the indoor waterpark area, we did take a break from swimming and water slides to visit Arcadia Adventures where the kids played arcade games and challenged their inner self balancing on beams on the indoor ropes course. The staff was more than accommodating to Jonathan who was scared to cross the ropes course. With their encouragement and one-on-one assistance, he overcame his fear and then didn’t want to get down. Although checkout is at 11am, you can continue to use the Camelback Resort indoor water park as well as the other amenities for the remainder of the day. There are changing rooms in the indoor water park area, as well as lockers. With the snack bar located right in side the water park area, you can pack up your vehicle and spend the day by the water, or down the street at CamelBeach Mountain Waterpark. 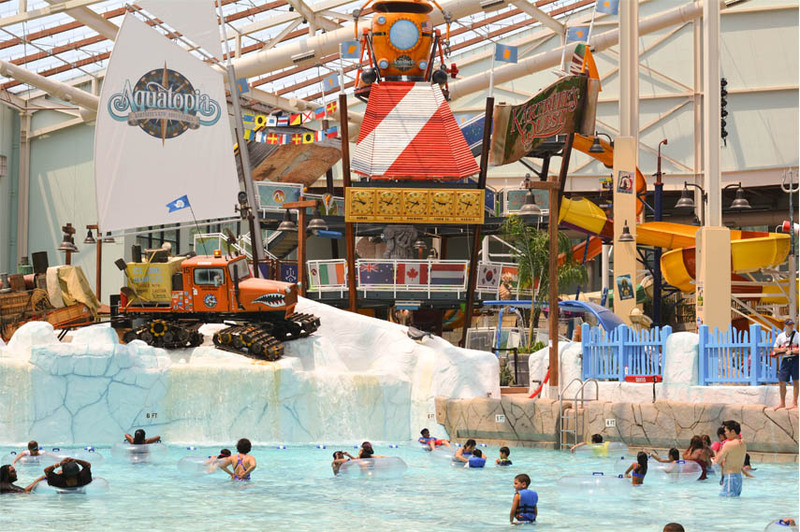 Aquatopia admission is included with your stay at Camelback Lodge & Indoor Waterpark. Book Your Stay & Receive Over $200 in Discounts! 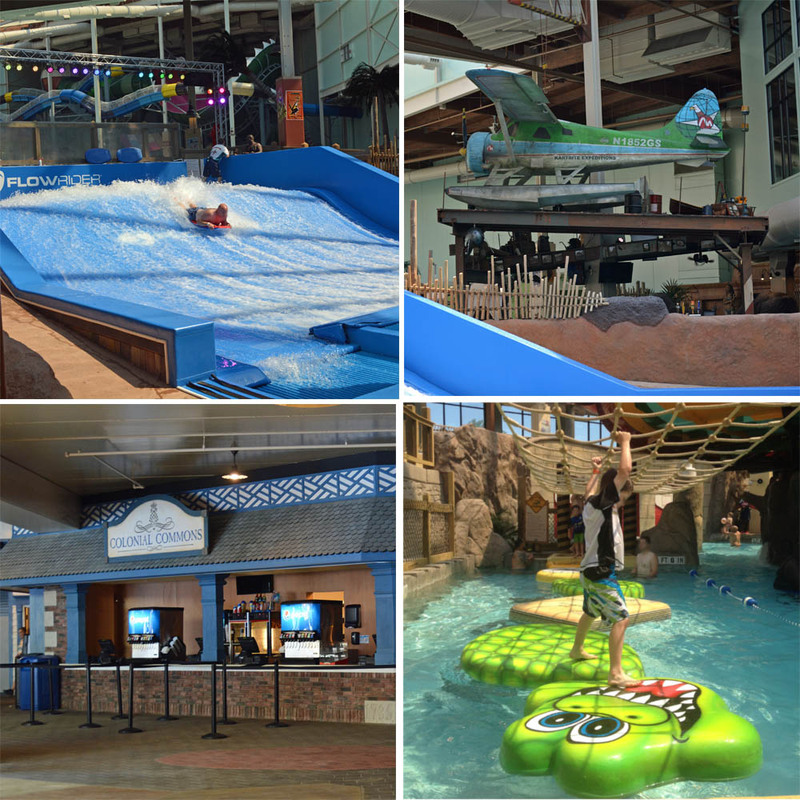 Book your stay at Camelback Lodge & Aquatopia Indoor Waterpark by Labor Day – September 7, 2015 and receive a booklet with over $200 in discounts and deals to make your stay even more memorable. 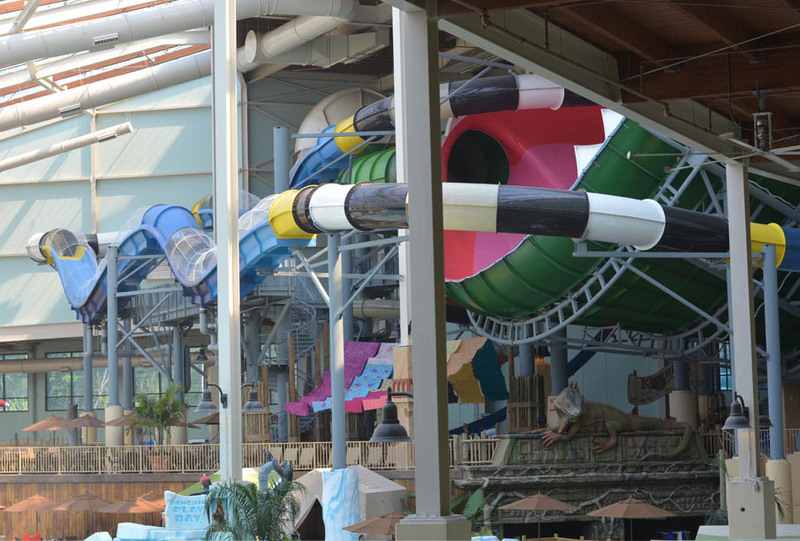 To keep up with the latest Camelback deals & Aquatopia coupons, sign up for the Camelback Resort Newsletter and Groupon. Looks like a fun waterpark for kids. I like the décor of the hotel rooms. How fun! Looks like an amazing place! This looks like an amazingly fun place to take the whole family! OH my gosh, that looks amazing! All the detail..wow…Carter would have so much fun there! That would be one of those vacations where you never have to leave the lodge! Wow this place looks great and do not live too far away. I will definitely have to add this to our travel bucket list!!! Thanks for the post. Would love to visit!!! Looks awesome!!! Can you let me know if there are any upcoming deals for August, especially on weekends. Thanks. 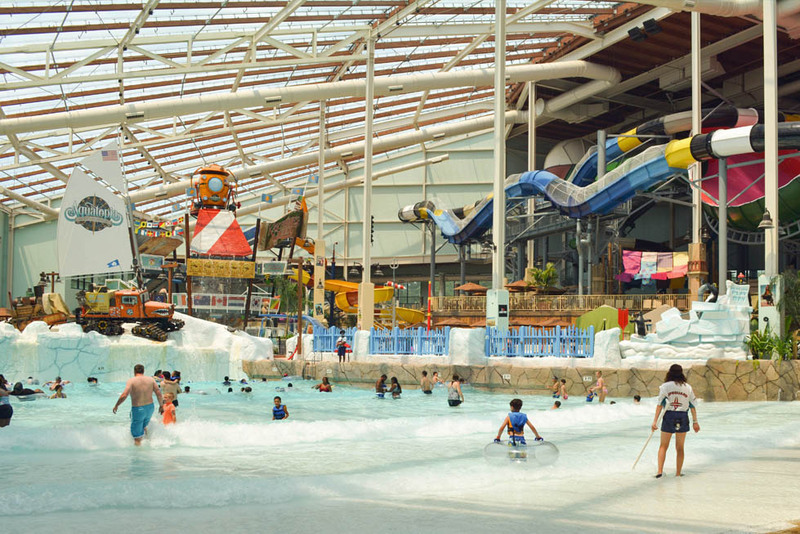 An indoor waterpark looks like a lot of fun! Maybe I can take my grandsons some day. I used to love waterparks as a kid. I’m more of an indoor person now, but those rooms look nice too! I don’t know if there’s any vacation more fun than a waterpark vacation, lol. I love water, whether it’s a swimming pool or a beach somewhere.